ARCHITECTURAL HISTORY:Nearly 38 ft. wide totaling approximately 12,100 sq. ft. (9,800 sq. ft. above grade), this mansion was originally built by architect John G. Prague between 1871-1875 as two four-story buildings that have since been combined. Around 1928 its original Italianate façade was redesigned to its current, modern, uniform front for famed artist, Lucian Hamilton Tyng. 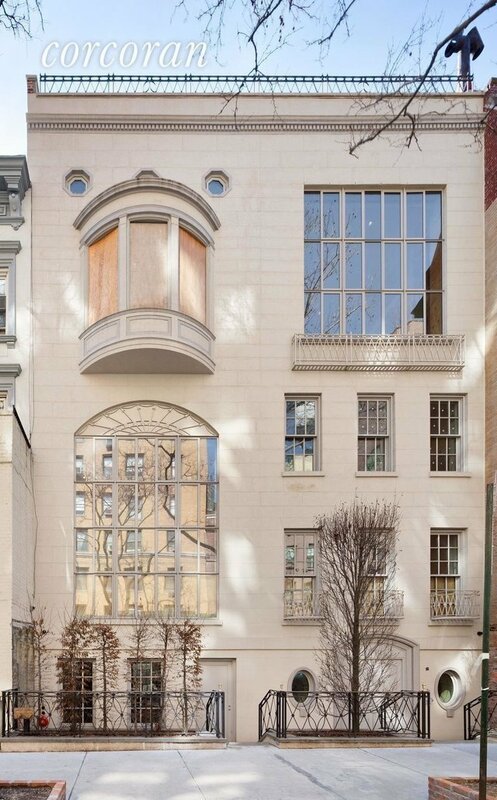 Today's Landmarked façade includes a large rectangular studio on the fourth floor of what was 134 as well as a large segmental-arched window on the second floor of what was 136. There is an oriel and three small octagonal openings for what is now a staff suite/third bedroom on the fourth floor located towards the eastern front side of the building.TODAY'S MODERN CLASSICThe story begins with the main gallery. Stone floors-grand, formidable ? Or wood-warm and welcoming. No matter. The winding, elliptical staircase that greets you leaves the same winsome impression of grace and elegance.Gather around the commodious kitchen: light gray, Christopher Peacock cabinetry accentuates the golden earth stones ingrained in the glorious white marble countertop and backsplash. The front sitting room is perfect for casual conversation and for sneaking quick bites from the kitchen while the garden, unviewable to neighbors, affords complete privacy for relaxation.The entertaining floor is a show-stopper with its double-width great room, soaring double height ceilings, double height windows, and wood burning fireplace. The adjacent dining room has a wood burning fireplace, too, as well as Juliet balconies overlooking the garden. The guest suite on the next floor include a bedroom, study and its own mezzanine salon overlooking the great room below. Contributing to the glamour is the master floor above with two master dressing areas outfitted with Christopher Peacock cabinetry, two full baths en-suite--each with beautiful bay windows. Plus a terrace and two balconies overlook the garden. But the highlight here is the awe inspiring double height library with double height windows and a wood burning fireplace.Four additional bedrooms, a staff suite, a recreation room and two terraces comprise the two upper floors. In the cellar is space for staff office, gym, steam room, full bathroom, wine cellar, and storage.Delivered "as is," much of the work in this new construction has already been completed. Brand new plumbing, wiring, floors, walls, HVAC system, elevator, dumbwaiter, the kitchen and its appliances, are all already installed. The rest is ready for the new owner to complete with whatever their desired finishes.85% of this storybook dream has already been written. Its new owner would possess the rare opportunity to write their own happy ending.